MIG Welders | R.J. Kates Co. 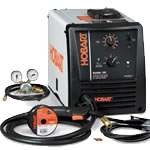 The Handler 140 can run these wires: .023 –.035″ mild steel or stainless steel, .030 –.035″ flux-cored, and .030″ aluminum. 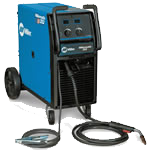 The Millermatic 252 portable MIG welder has the highest output in its class (250 A at 28 VDC) with an amperage range of 30 to 300 amps. 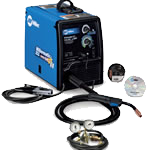 The Miller Multimatic 200 is the only all-in-one, portable, multi process power source from Miller making it Miller’s most versatile machine. 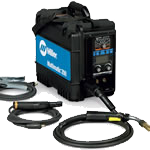 The Millermatic 140 portable MIG welder has Auto-Set and handles the processes of MIG (GMAW) and Flux Cored (FCAW). 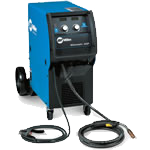 The Millermatic 350P portable MIG welder processes: MIG (GMAW), Pulsed MIG (GMAW-P), and Flux Cored (FCAW). 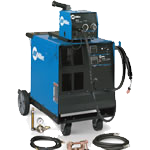 Miller’s MIG CP-302 with an adjustable weld stabilizer provides flexibility in producing optimal arc characteristics, for MIG (GMAW) and Flux Cored (FCAW). 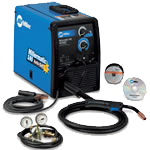 The Millermatic 211 Auto-Set™ with MVP™ has the highest output in its class, welding 24 ga-3/8 in (0.8–9.5 mm) mild steel in a single pass on 230V.